you got a lotta dead bugs! 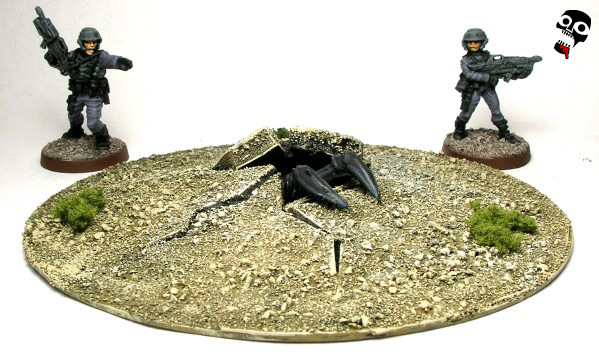 What's scarier than a giant bug coming out of a hole behind you? 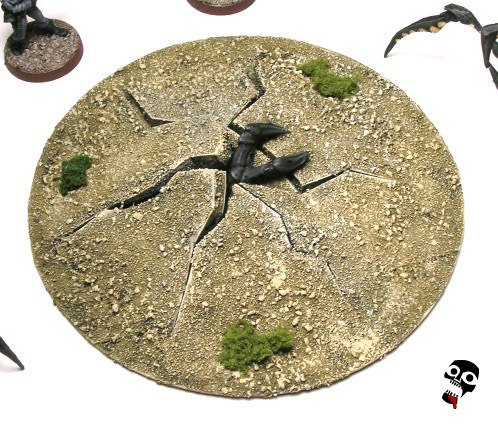 I really wanted a different look for my bug holes than the average looking rabit hole style that was used in the SST rulebook from Mongoose Publishing. Those look pretty good, but their depth is not all that convicning and they don't really fit all that well with the great looking models or the theme of the movie. So, when it came time to make something, I went to the movie to look for inspiration. 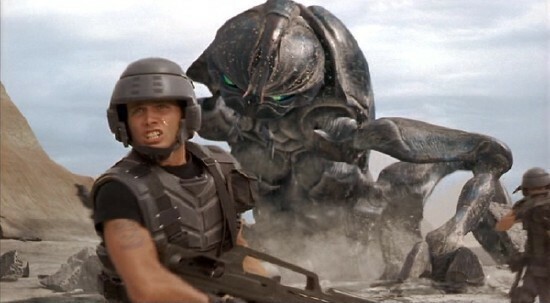 After watching the movie, and realizing I needed to convey depth without having depth, I decided to go with the coolest arachnid bug hole action in the movie: the arrival of the first tanker bug (as seen in the pic above)! So, I set out to put a couple together. I have a lot of scrap foam core left over from old projects and I figured this would be a great way to use some of it. I also have a lot of old CDs and DVDs that I no longer need... I never want to throw them away because I am always sure I will need them one day! So, this project offered a great opportunity to use up some left-overs! 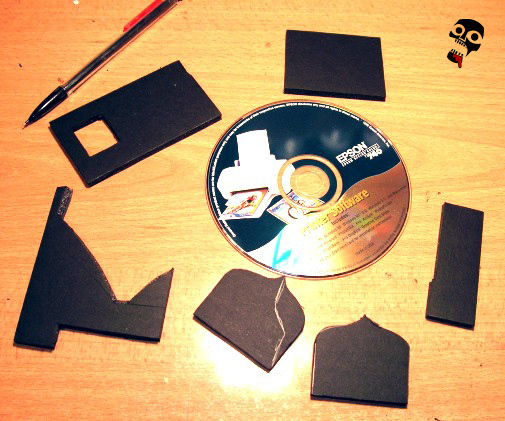 Grab some foam core scraps and an old, useless CD. I had an old printer driver CD, but I think that any Microsoft XP or Vista install disks would work even better! 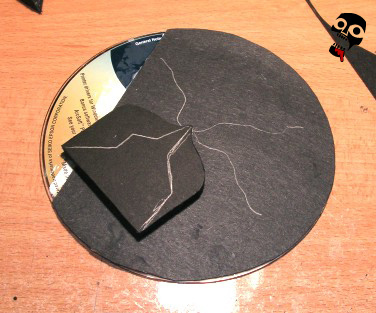 The first thing I did was cover (most) of the CD with black construction paper. I needed to cover the hole at least, and I had some scrap construction paper... But seriously, the more construction paper that is on the CD the better because gluing the important stuff on becomes easier. 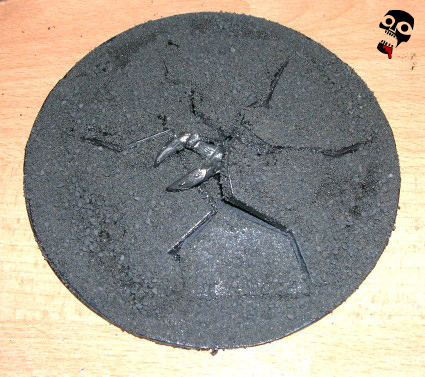 It also helps with base coating; Black construction paper doesn't have to be base coated black later! 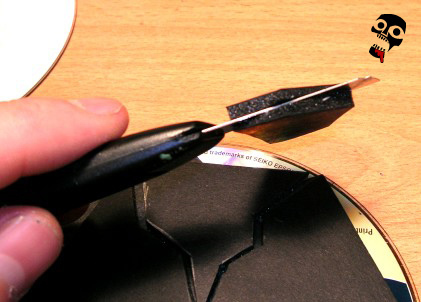 White glue works fine here, I didn't even need to rough up the surface of the CD! The CD (mostly) covered in construction paper. Once the construction paper is on, I did a quick sketch of the crack pattern on it just to give me a basic idea of how I was going to arrange things. 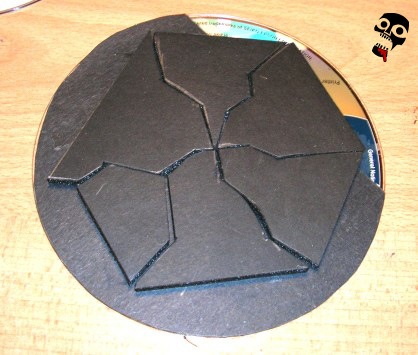 Then I reproduced part of the cracked pattern on to one of the scraps of foam core I was planning to use. Once done I cut the first piece, then I used that piece to trace patterns on the other pieces. I did this for each piece until I had cut all the pieces I needed. Starting to shape the foam core scraps. A this point you may realize that this process would be easier if you started with a single piece of foam core, and you would be right. The reason I didn't use a single piece of foam core was just because I wanted to use up my scraps. 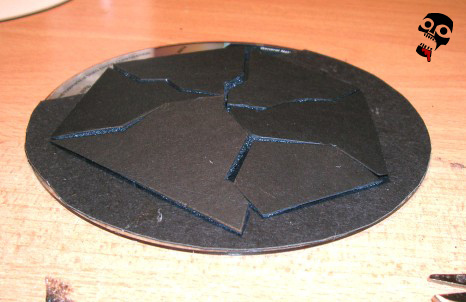 If you want to just start from a simgle piece of foam core, simply cut out a polygon and trace cracks on it, then cut the pieces out in the same way. You may be tempted to cut out a circle instead of a polygon here, but don't. The seperate pieces will have a hard time sitting flush against the CD if they have curved edges, so straight is better in this case. All of the pieces are cut into the proper shape and ready to go! 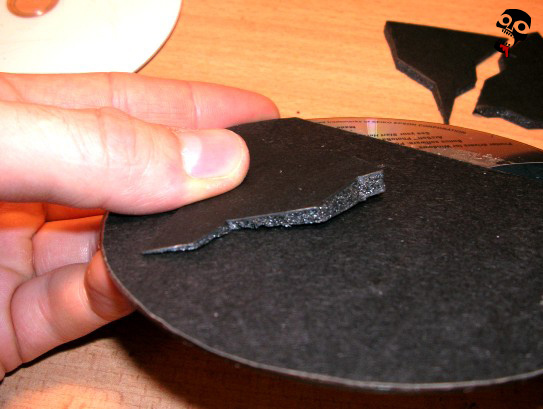 Here I am cutting a piece so that it will sit at an angle on the CD. This should be done for all of the pieces of foam core. Don't worry if the angles are different on each piece of foam core, as anyvariation will actually add to the realism. Test out each piece and make sure that the straight edge sits flat against the CD, and if it doesn't trim it so that it does. 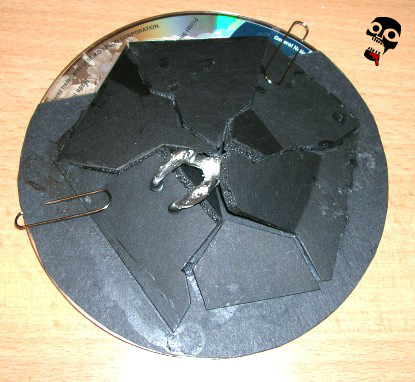 Here is how the pieces should sit on the CD surface. Once they are all done, put them down on the CD surface and arange them in a pleasing way. At this point you want to think about where you are going to put the extra cracks. That is, the breaks in the pieces that will make it look like the bug that is about to emerge is pushing up with that much more force and speed. All of the pieces cut and ready to have the final details added. So, once this is done, pick your bug part and figure out where it will go. 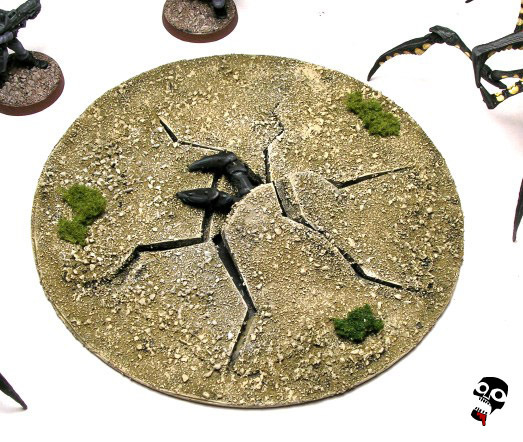 In this case I used an extra tanker foot, but arachnid warriors legs work just as well, if not better, and they are much more readily available. Also at this point, cut further cracks into each piece as necessary to make room for the bug part. In this example, I cut the underside of two pieces at about the middle point where the bug foot is protruding so that they could be bent up, making it look like the emerging bug is breaking them. I also cut the top of one piece where the foot is stepping to give a sense of weight. Just do whatever looks good and gives the impression of movement. Once you are happy with the composition, glue it all in place. Use white glue for the foam core and super glue of the bug foot (arachnid warrior and tanker bug foot should be super glued!). 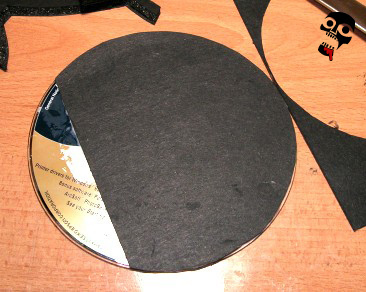 You may have to use paper clips to keep the edges of the pieces flush to the CD surface until the glue dries, so have some handy. The pieces are glued into place, and some paperclips help keep the edges down. After the glue is dry, it is time to throw some sand and rocks onto it for texture. Try to put the sand and rocks on to cover up where the edge of each piece meets the CD surface, as sometimes a line is visible. If the line is still visible after the glue dries on the first layer of sand, put another layer of sand and rocks over it. This will typically cover these lines well enough so that they aren't noticable. 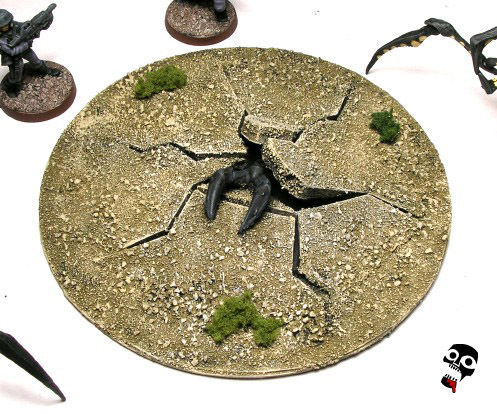 The hole is covered in sand and rocks and once the glue is dry it is ready to be painted. To paint I put down a watery coat of Vallejo Khaki Gray (only because I had one litre of the stuff mixed for my Lothlorien terrain project) Once that was dry, I put down another coat of it, and then drybrushed it with ivory. 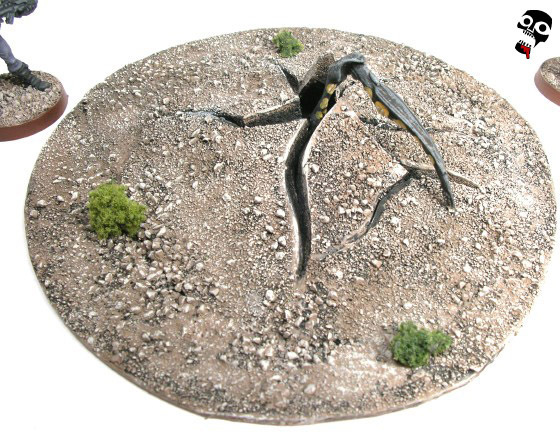 Finally, put down some of that woodland scenics clump foliage for flavour, and also to help further cover up any obvious lines where the foam core meets the surface of the CD. At this point, paint the bug body part however you want to fit with your bugs and you are done! Below are some pics of the finished product, as well as my other bug hole!